Who: Residents and businesses invited. When: Arrive from 6.30pm for refreshments. 7pm start. Details: The meeting will be independently chaired by Phil Upton, of BBC CWR. Phil will take questions from the floor for the panel of Warwick District Councillors and Senior Officers responsible for the delivery of the ambitious HQ plans and car parking displacement plan during the development of Covent Garden Car Park. Meeting – Option 2: Tuesday 13 November – Morning. Please RSVP. Businesses Only. 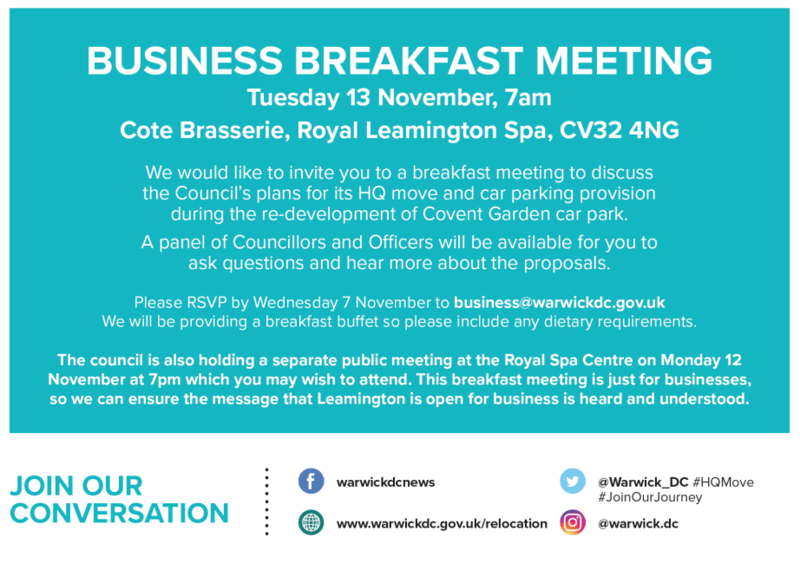 Details: You are invited you to a breakfast meeting to discuss the Council’s plans for its HQ move and car parking provision during the re-development of Covent Garden car park. A panel of Councillors and Officers will be available for you to ask questions and hear more about the proposals. We will attend them both – you are welcome to also. If you cannot attend and have any specific questions please let us know and we will endeavour to have them answered. Please also do not hesitate to get in touch if you would like to have a conversation about this – work is ongoing. For details of the work we have been doing: https://www.bidleamington.com/work-is-on-going-covent-garden/. Please feel free to pass the details on to neighbouring businesses. Much is still to be done before a robust strategy is put in place to cover the temporary loss of one of Leamington town centre’s busiest car parks. This is the view of BID Leamington, in response to an update from Warwick District Council on its strategy to create enough parking spaces to be in place for the 20-month period of when the 468-space Covent Garden carpark closes to be replaced by a new car park, apartments and local Local Authority headquarters on the site. The report, which was approved by the Council Executive, follows a very well attended public meeting which was held on the 19th of June. Approximately 150 people, around 60 of which were business owners filled the Spa Centre to question Council Officers on the scheme. 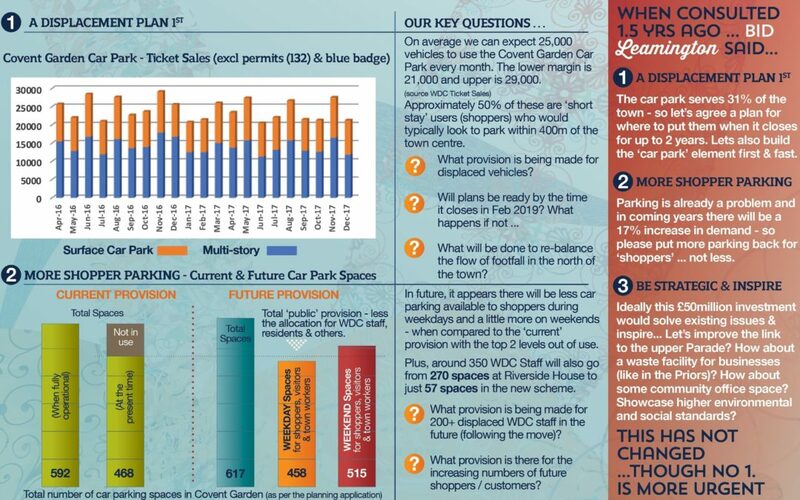 Among other things the questions focused on five key questions relating to car park displacement, loss of footfall, timing and future provision set out in the graphic below. Following the 2.5 hour long meeting it was agreed that further engagement directly with the business community was urgently needed, as there were many questions that remained unanswered. It was also agreed that specialist car parking expertise is engaged to review plans. One month on, BID Leamington are pleased to see that a number of our suggestions have been agreed in the July 25th, Executive Report. This includes funding towards a communications plan and the engagement of specialist expertise to review the WDC’s car park displacement plans. The review, being undertaken by a specialist parking consultancy which we helped select, started this week and will look at the impact of the closure of Covent Garden Car Park, what is proposed and recommend further measures to minimise disruption and re-balance footfall in the north of the town centre. We anticipate further recommendations may need to go forward to Officers and Members following this work. Engagement with Warwick District Council is also ongoing. We have further meetings planned in early August, with a focus on addressing the concerns of businesses in Warwick Street who will be among those impacted by the loss of footfall when the car park closes. There are also calls for a follow-up ‘business meeting’ open to all local businesses to take place when WDC plans are clearer. 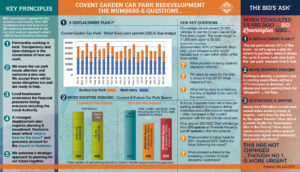 We are mindful that the proposed closure date of Covent Garden Car Park of January 2019 is less than six months away and there is still a lot to do. Much of the proposed ‘additional car parking’ needs planning permission to be built or in the case of Station Approach will not be ready until late 2019, so we are seeking reassurances that the Covent Garden Car Park will not be closed until an adequate plan is ready to be delivered. The importance of this has also been confirmed by recent ‘Institute of Place Management’ (IPM) research which identifies ‘accessibility’ as among the top two criteria impacting high street vitality, the other being ‘footfall’. This means we need to welcome and deliver investment that puts these issues and local business interests at the heart of the conversation. Image: Covent Garden Car Park Meeting – 19th June, 2018. Key Numbers & Questions. 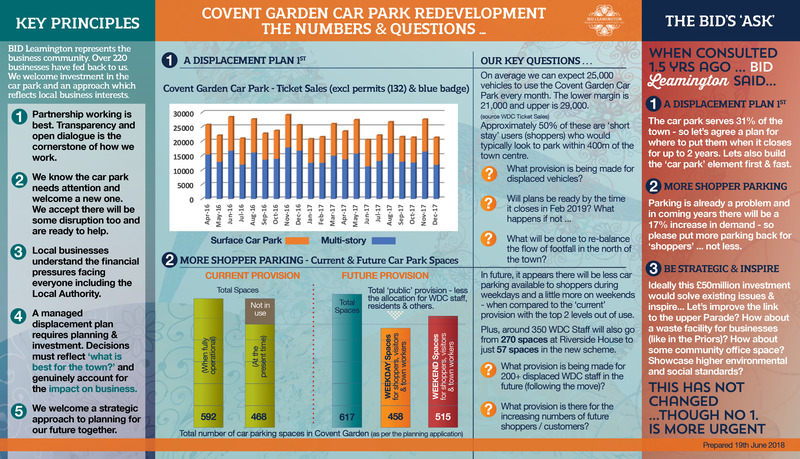 Prepared by BID Leamington, using figures set out in the Covent Garden Car Park Planning Application (as Approved on 9 Jan 2018) Ref: W17-1700. 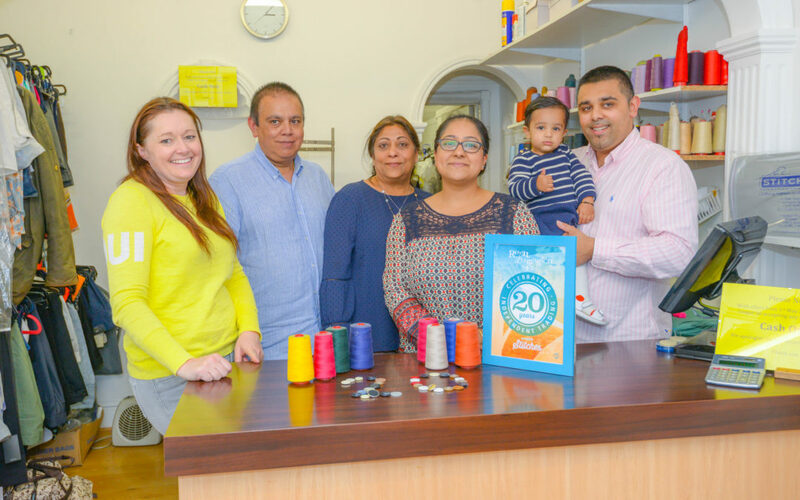 A clothing repairs and alterations business has sewn up 20 years of independent trading in Leamington. PICTURE CAPTION: Pictured, from left to right, are Stephanie Kerr with Subhash and Arvinda Gohil, and Shilpa and Manesh Gohil with their daughter Nivah. Today it was announced that Leamington’s House of Fraser store will be among the 31 House of Fraser stores are set to close nationwide. “Our thoughts are with the staff as we have come to know, there is something wonderful about them and their commitment to serving the customers of the town. 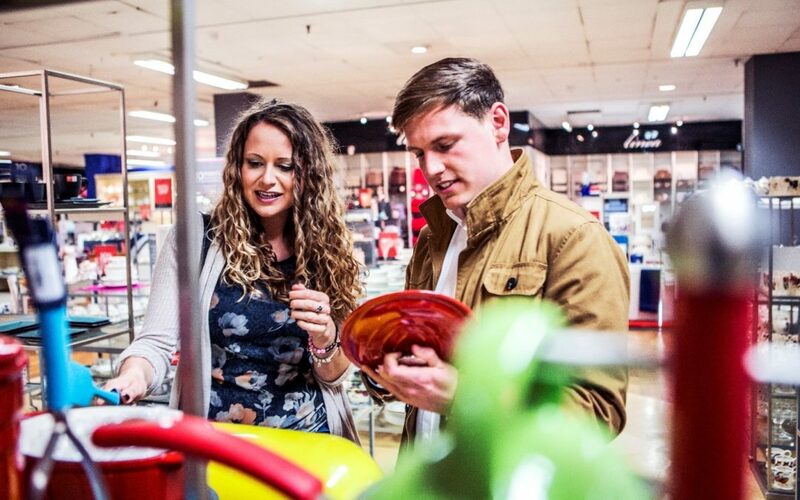 “In recent months, BID Leamington has supported House of Fraser’s efforts to collaborate with independent businesses in the town to showcase the local offer and enhance the shopping experience. “This type of creative partnership is something we are keen to foster as our independent sector is particularly important and continues to prove itself to be agile and innovative. “The BID has been recently renewed and an important part of our role is helping to support businesses and guide change so we will also look to reach out to the landlord and other partners to do this. 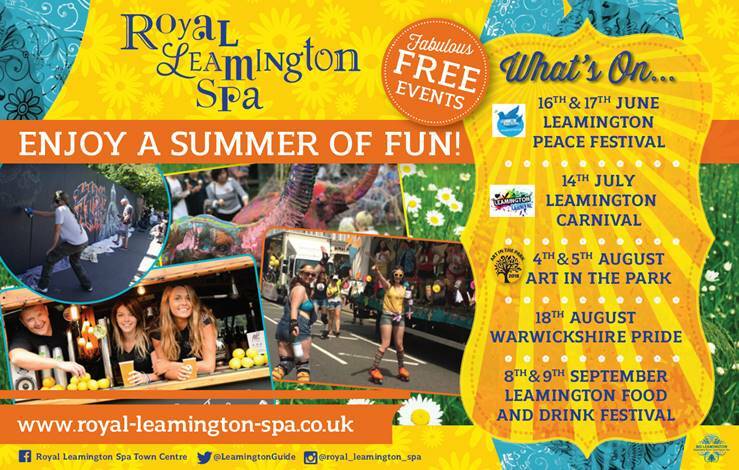 “After ten years of the BID, we also know that Leamington is a wonderful, creative town with a lot happening and the people of Leamington will help us achieve this. “The BID Leamington Board will meet next week to look at how we can support this transition and there is a lot of business talent and creativity locally to draw from. “Our approach has always been to ‘roll up our sleeves’ and work together to ensure the town center thrives. Strong Support for Another Five Years! Businesses have overwhelmingly backed the Business Improvement District (BID) for a third term to continue the partnership’s work in helping to ensure the town centre thrives. 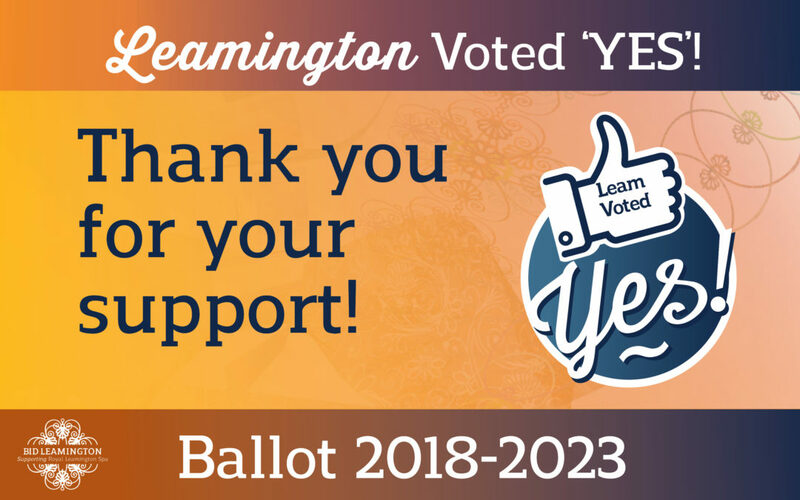 The ‘yes’ vote for BID Leamington means businesses will still be represented on key issues, and the town centre will benefit from more than £1.9 million of investment over the next five years. The result for BID Leamington was announced today (Wednesday, March 29) following a month-long postal ballot of businesses eligible to vote. The official result was 79 per cent in favour by number and 85 per cent in favour by combined rateable value. 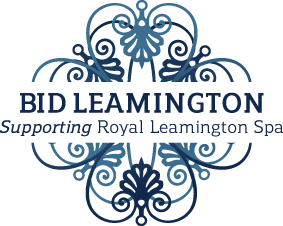 Stephanie Kerr, executive director of BID Leamington, said: “We very much appreciate the trust placed in us by those who have voted and are pleased that BID Leamington has been given the backing of the businesses to build on our achievements over the last five years. “The result provides a strong mandate and holds itself in high accord across the industry as well. “Faced with challenges greater than ever before, the business community has recognised the value of retaining the BID as their collective voice on important issues such as development and parking, and in helping to secure a vibrant and successful town centre. The strategy will focus on addressing key priorities which include attracting footfall, car parking, out-of-town and online competition, ensuring a strong retail economy and balancing a mix of outlets. It will also build on the BID’s strong digital representation of businesses via the Royal Leamington Spa and Taste Leamington websites, and social media platforms which have 20,000 followers. Businesses first voted to establish BID Leamington in 2008 and have now twice voted to renew the award-winning partnership, which is recognised as one of the most creative and innovative small BIDS in the UK. All retail and leisure businesses within a set boundary and with a rateable value of more than £15,000 pay an annual levy for the non-profit making organisation. The levy and additional income generated by the BID contributes to the Christmas lights, and funds the hanging baskets as well as major events and promotions in the town like the Leamington Food and Drink Festival, Lantern Parade, Car Parking Angels, Pumpkin Path and Love Leam. Sarah Horne, chair of BID Leamington and owner of Sarah Horne Flowers, said: “We would like to thank the local business community for its continued support. A ballot was held on the proposal to renew the Business Improvement District (BID) for Leamington Spa Town Centre for a further 5-year period from 1 July 2018 to 31 June 2023. This is a confidential postal ballot commissioned by the Ballot Holder, Warwick District Council. The BID ballot procedure is conducted in accordance with ‘Local Government Act 2003 Business Improvement Districts (England) Regulations 2004’. For the BID to be successful, of those that vote, over 50 per cent by number and 50 per cent by combined rateable value must vote in favour of the BID. Each business entitled to vote in a Business Improvement District ballot is allowed one vote in respect of each property occupied or (if unoccupied) owned by them in the geographical area of the Business Improvement District. The ballot was conducted entirely by post on behalf of the Ballot Holder, Chris Elliot, who is the Warwick District Council, Chief Executive, by the Independent Scrutineer, Electoral Reform Services (ERS) of 33 Clarendon Road, London N8 0NW. The official declaration of the result is here. The ERS declaration can be downloaded here. For more information please contact the BID team on 01926 470634 or email info@bidleamington.com.